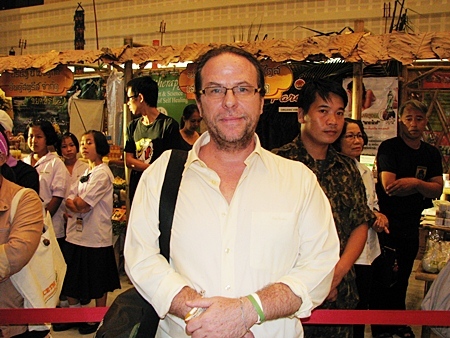 Well known entertainer, tv show host and author Todd “Thongdee” Lavelle paid a visit to the opening ceremony of the Chiang Mai International Conference and Exhibition on Traditional Medicine at Central Hall at Central Airport Plaza on August 24, 2011. 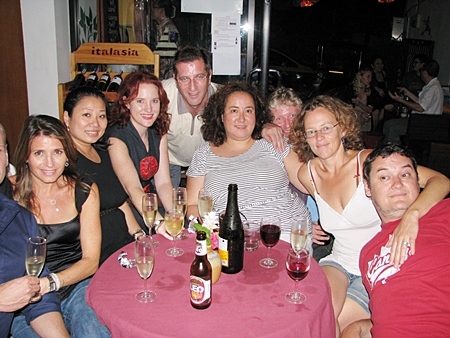 Pim Kemasingki of CityLife Magazine and friends met up at Sangdee Gallery on Sirimangkalajarn Soi 5 for the popular open mic night that sees many local performers join in. “Pang” Prakasit Bosuvarn (left), a well-known actor, singer and commentator on True Academy Fantasia recently visited the Kantary Hotel, Chiang Mai where he was welcomed by Resident Manager Yamamoto Takayuki. 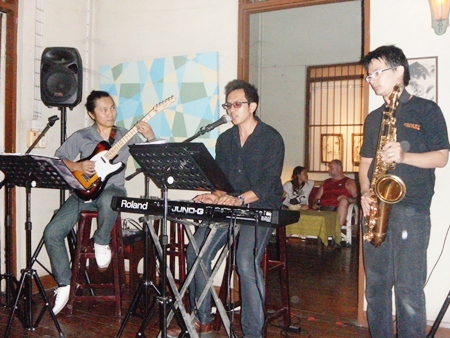 A very popular jazz band played at the 2nd Floor Gallery’s live music night on Saturday, Agusut 20, 2011. 2nd Floor Gallery is located above the Kodak shop on Ratwithi Road and hosts live music every Saturday night. During the week they play host to salsa lessons. Neville Powis, a local filmmaker and actor, joins blues singer and guitarist Jeff at the microphone for an impromptu session at Sangdee Gallery on Sirimangkalajarn Soi 5. Famous Thai rapper ‘Joey Boy’ or Apisit Opasaimlikit (left), was warmly welcomed by Kantary Hills, Chiang Mai Resident Manager Takayuki Yamamoto when he stayed at the hotel recently. 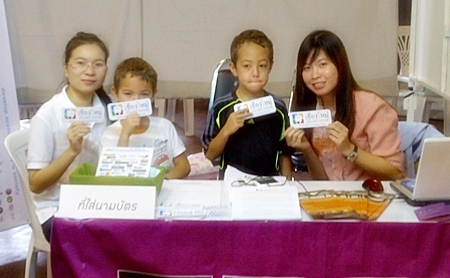 The Long Stay Magazine recently celebrated its 4th anniversary at its offices at the Centara Duangtawan Hotel. The magazine held a poll regarding what could be done to make the magazine more attractive, Dr. Dirk Weeber Arayatumsopon did not hold back with his criticism and was awarded with one of the main prizes. 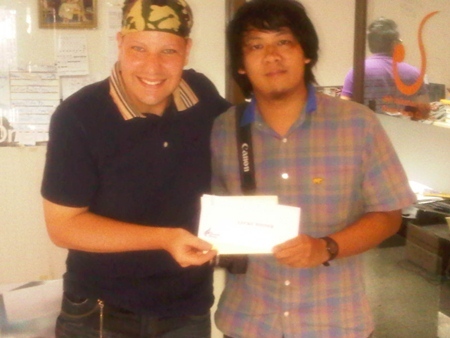 A round trip flight ticket for 2 people from Chiang Mai to Bangkok and back. Chiang Mai Deputy Governor Naruemol Plawat (center) is joined by Central Airport Plaza General Manager Orachorn Chanwiwattana (4th from the right) officials and Central staff in promoting no plastic bags and the use of recycled materials at the Central Airport Plaza. David, John and June braved the rain for live music at Sangdee Gallery on Wednesday, August 10, 2011. 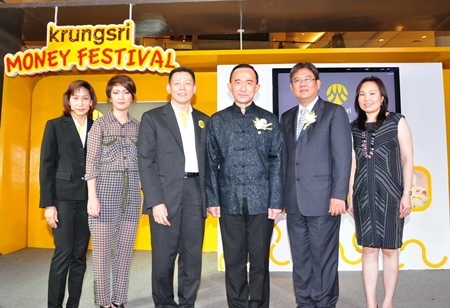 Chiang Mai Governor ML Panadda Diskul is joined by Central Airport General Manager Orachorn Chanwiwattana at the Krungsri Money Festival held at Central Airport Plaza. With them are Krungsri Bank executives and staff on hand to answer questions about finance and banking. 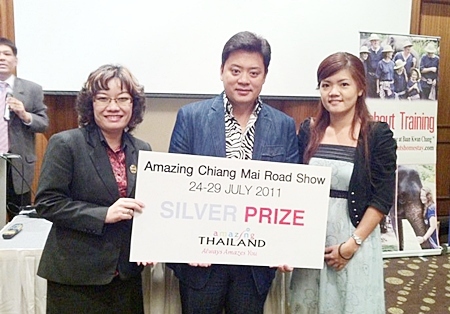 Chiang Mai Night Safari CEO Dr. Sarawut Srisakhun and staff members show off the silver prize award they took at the Amazing Chiang Mai Road Show for their work in promoting Chiang Mai in Singapore and Indonesia. 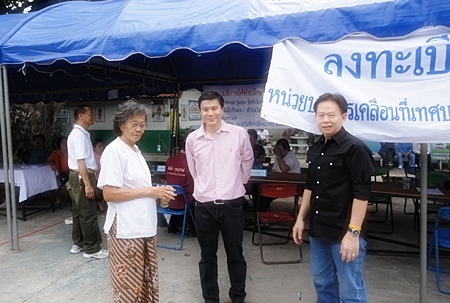 Chiang Mai Mayor Tussanai Buranupakorn dropped in to check on the municipal services offered every weekend at Nakhon Ping Road on Saturday, July 30. Free services offered to city residents include tax counseling, eye checkups, rabies vaccinations for dogs, birth, death and ID card registration and more. Popular Thai bands Super Baker and Tattoo Colour performed a free show at Central Kad Suan Kaew recently, with the Denim Live show giving out free prizes to concert goers. The bands are seen pictured here before the show.